On Saturday, October 8th, Boston ICO trip leader Jeff met St. Peters leader Ashley and 11 5th grade boys and girls at St. Peters to drive out to the Honey Pot Hill apple orchard in Stow, MA. The group headed out on a crisp fall morning and drove through the fall foliage to the orchard, arriving around 10:30. 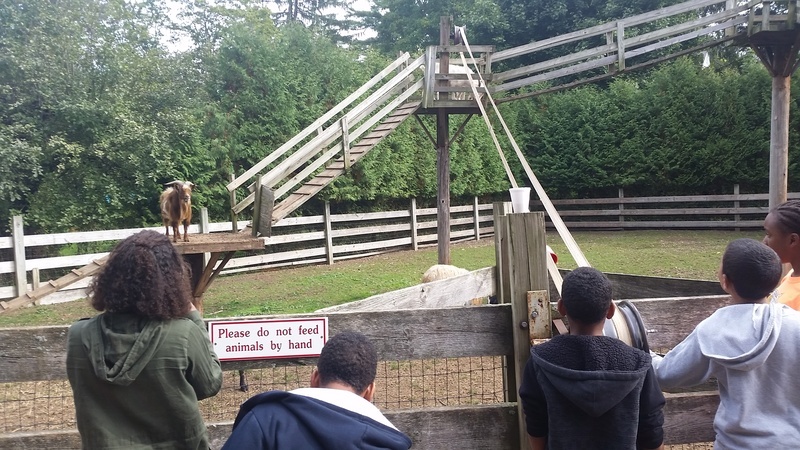 We quickly grabbed our apple bags and headed on a hayride through the orchard to visit the farm, where we saw (and fed) the rabbits, chickens, pigs, and most importantly the goats, by using a pulley system to get food up to their climbing structure! After that we headed out into the hilly orchard to fill up our bags with all kinds of apples. The helpful staff was able to answer all our questions about where to find the best apples, and we learned (and collected) all kinds, including Red Delicious, Cortland, Empire, Macintosh, and Mutsu apples (which were our favorite - party because they were so big and fun to pick from the ladders! ).